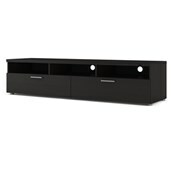 Clean cut and functional, the Napoli tv-Unit has everything you need for media storage. With two open shelves that provide clear access for media components and one wide drawer, there is ample storage space for DVD’s, game controllers, and remotes. Keeping things organized in the back are cord cutouts that neatly guide necessary cabling from each compartment. The Napoli tv-Unit is adorned with streamlined metal hardware and has a Melamine surface that is easy to clean and durable against scratches, heat, water, and stains.